Having established that the new BMW 3 Series is already a satisfying driver’s car in just about every trim available, it’s great to hear reports that the upcoming BMW M3 will be an enthusiast’s dream, with a “pure” model with over 450 horsepower, rear-wheel drive and a goddamn manual. When we realized that the new 330i and M340i would not be given the gift of a manual transmission, we were sad. Having the option of a stick in a non-M3 3 Series is what set the last generation car apart from most of the other compact luxury segment. And now it’s gone. The good news now is maybe the new M3 won’t disappoint us. The tantalizing tease comes from the latest report from Car Magazine, which claims the next M3 will be available either in a real rear-wheel drive layout, or with a rear-biased all-wheel drive xDrive system similar to what’s on the new BMW M5. ﻿The extra power was a given. What was less clear was how many wheels the new M3 would put it through. The answer: either two or four. 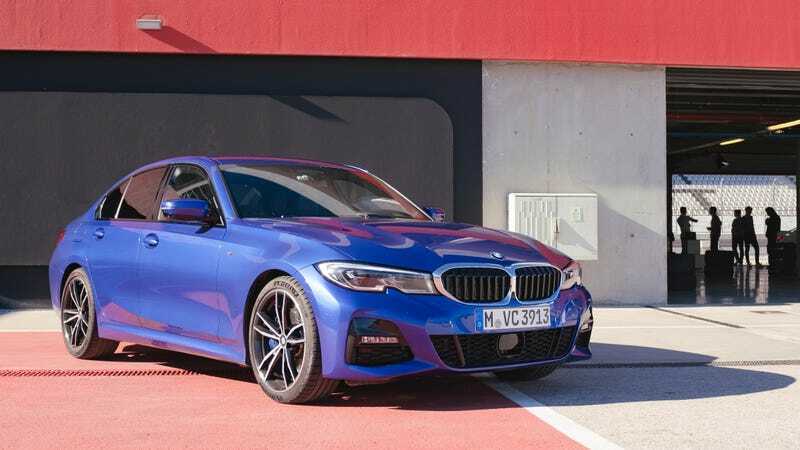 Base versions of the new M3 will be purely rear-wheel drive, while pricier M xDrive all-wheel-drive variants will include the same 2wd toggle mode as the M5. Having driven the new M340i with the rear-biased xDrive last month, I can say that car is a hell of time with just its 382 hp. The trick AWD system can still get very much sideways if you push the right buttons. I can’t imaging what another heap of nearly 100 hp will do to it, and I can’t wait to find out if this report ends up being accurate. Car Magazine also claims the next M4 will get a soft-top convertible option instead of the current hard-top, and eventually be offered as M4 Competition (Car Mag claims around 2021), CS, and CSL packages. There may also eventually be an M4 Gran Coupe model, too. We’re reportedly going to have all of this confirmed at the Frankfurt Motor Show this September, so don’t hold your breath.